Newcastle midfielder Joey Barton will make his comeback from injury on Tuesday when he plays former club Manchester City in a reserve match. Barton, 25, has been out since breaking a bone in his foot in pre-season following a £5.8m move from City. 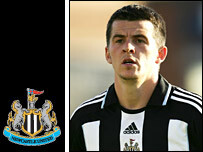 But Magpies boss Sam Allardyce said Barton would not be ready for first-team action for some time. "It will be four or five weeks or at least three or four reserve games," said Allardyce. Barton had raised the prospect of a possible return for the game against Everton on Sunday but Allardyce has ruled that out. The prospect of Barton's return was raised after he travelled with the squad to their last three away games to give his team-mates moral support. But the partial fracture of his fifth metatarsal sustained against Carlisle in July has needed a lengthy healing process and he will have to build up his match fitness before he can contemplate any first-team action.